← Patent, Publish, Or Keep It A Secret? It didn’t seem that anyone was hurt, although the damage to the two cars was not trivial. I was always impressed on the way that they handled the aftermath. Kaptain Krunch and Krash Gordon stayed seated behind the steering wheel, just sitting there in the middle of the intersection. After awhile, Mr. Krunch drove off and left Mr. Gordon hanging there without any exchange of information or even getting out of the car to observe the damage. Then Krash Gordon was trying to restart his car with pieces of his and the other guy’s car sitting in the intersection. Krash eventually got the car started while Kaptain Krunch was still within eyesight and the surrounding streets were almost empty of traffic. As I watched, I thought that Krash Gordon would chase after the Kaptain. Instead, after tentatively getting his jalopy to move forward, Krash Gordon turned in another direction and drove off without going after Kaptain Krunch. My impression was that after the first guy took off, the Krash Gordon must have figured that he did not want to call the cops or bother with an insurance company. Maybe he did not even have insurance and maybe he had warrants out for his arrest. Either way, it seemed that both guys thought that the practical response was to just brush off the dust and forget about the accident, or at least beat it before a cop shows up. Well, when you meet someone by accident, what do you do? Do you hightail it out of there like Kaptain Krunch and Krash Gordon? Or do you blow your stack and start yelling at the other driver? Perhaps, you do neither, but you still should think practically like those other guys, by putting things in perspective, but hopefully not missing key details. Before you learn some things to do in case you get in a fender-bender, consider driving safely to minimize your chance of meeting someone by accident. You can avoid accidents by making safety a priority. Perhaps you think that everyone on the road is an idiot and you’re the only smart one out there. That’s fine, but since not everyone else is able to handle driving properly, dumb down the process for them. They get confused when you turn without signaling, cut off people because you don’t want to anticipate lane changes, roll through stop signs, stop over the line in intersections, or do other unexpected maneuvers. Stay with the traffic flow – don’t go too fast and don’t drive too slowly. If you miss your turn, go around the block and get it right next time instead of cutting off the texting driver behind you that will end up rear-ending you. Do you really need to be at that boring meeting on time? If some idiot crashes into you because you just have to make it to the lousy job on time, you’ll be even more late, have less money, and less enjoyment in your life. Leave earlier. Now, despite your good efforts, you still meet someone by accident. First, is anyone hurt? Attend to hurt people first, call 911. Next, yell at the other driver, “You idiot! I knows mah rights. You done messed up! Ef you!” That might not calm things down well, but you’ll feel good. By the way, smile, because you will probably be on camera. There are surveillance cameras everywhere and all those texters behind the wheel are snapping video of you acting in your best form. Rest assured that you are making evidence that can be used against you later. So, stay calm, and think. Don’t sit there and wait like Kaptain Krunch and Krash Gordon. Get out your proof of insurance (you do have insurance, right? ), drivers license, and registration. Put your best foot forward. 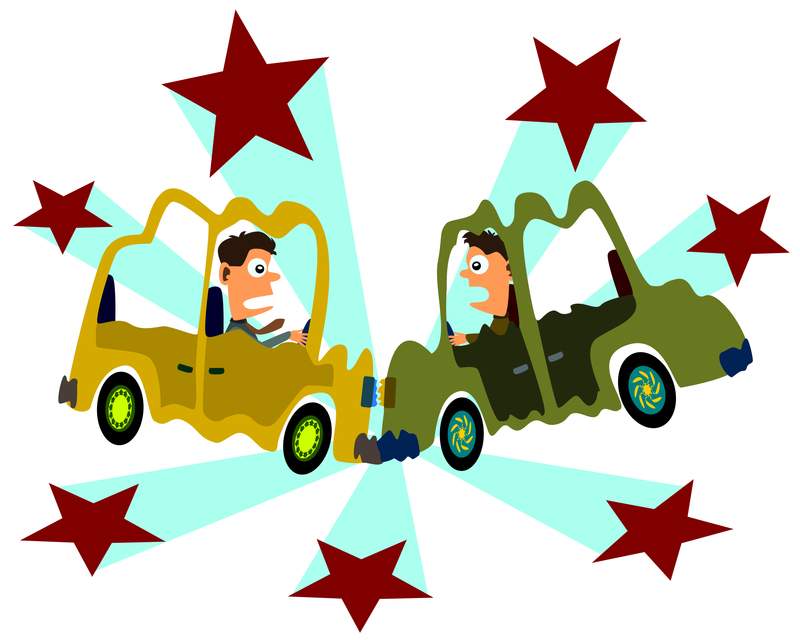 You don’t need to admit anything, but you could say, “I’m sorry that we had an accident.” Maybe your peaceful demeanor will make the other drive calm down. Do not argue about what happened, such as what color the light was, or who got to the intersection first. There is no need to waste your time and nerves on useless endeavors. The other driver is not likely to say, “Well, you are absolutely correct. I was wrong and I now owe you a million or two for your damages.” Worse, you may say something that can be taken against you. Now, you want to make sure that you gather the relevant information to help you legally if there is further litigation. Look at the identification. Is that really the person who was driving? People with bad driving records will often carry their brother’s or someone else’s license around and present that one so that no one finds out that they don’t have a valid license. Does the driver’s name match the registration and the proof of insurance? Perhaps the driver is driving someone else’s car, maybe their boss’s car (kaching!). If so, the true owner of the car could be liable for letting that numbskull drive the car when the owner should have known the driver’s bad record or lack of a license. Take photos of the documents and the license plate. Take several photos of both cars to get a good record of the respective damages. You want to avoid the other driver later exaggerating the amount of body damage. One thing to watch out for is when the other driver tells you that they will not report the accident to their insurance company or the DMV. Don’t trust them. Often, they say this and later you receive a notice from their insurance company and a letter from the DMV saying that you were in an accident that you failed to report. Perhaps they went home and friends and family convinced them to report the accident, slap a white collar on their neck, and other things. In California, the DMV can suspend your license for not reporting a traffic accident. You trusted the other driver and now you lose your license because you didn’t fill out a form. Now, think about the amount of damage to your vehicle and the other vehicle. Is your damage under your insurance deductible? If so, what’s the big deal? I once had a shifty person try to avoid giving proper proof of insurance and he had nonsense excuses that he couldn’t wait for the police to arrive to investigate the accident. Smells funny, right? Yes, it smelled funny, but I was lucky enough that the amount of damage to my vehicle was minimal. I could have run the whole thing up a flagpole and asserted my rights (“Hey, I’m a lawyer! You’re going to get nailed for this!”). I could have made his life miserable, for a while. However, it already is miserable for him. I would need to spend my time to investigate him, pay court fees to file a suit, find his proper address to serve him with a lawsuit, and convince a judge to issue a judgment, all of which costs me more time and money than my deductible. After all of that time spent chasing after him, I could make more money working on paying cases for clients, or at least spent my time writing lousy articles like this one. My accurate information was exchanged for his questionable information, but I brushed it off and moved on. Frederic M. Douglas is a solo practitioner specializing in litigation involving intellectual property (patents, trademarks, trade secrets, copyright, and more). Mr. Douglas has been registered with the U.S. Patent and Trademark Office for over 12 years. Before college, he drove a taxi for eight years in Ventura County California. This entry was posted in Uncategorized and tagged accident, auto, automobile, insurance, personal injury. Bookmark the permalink.